Chef Dez On Cooking: The Keto Diet – Is it worth it? Langley Advance’s culinary columnist gives Keto diet a try, despite cynicism about diets in general. Jan. 31, 2019 6:00 a.m.
By now I am sure you have heard of the keto diet, or at least have heard the term “keto”, but what is it, and more importantly does it live up to all the attention it is getting? The first thing I want to point out however, is that I am not carrying a tremendous amount of excess body fat, but I do have my share. Having a profession as a chef makes it very challenging to stay on any restricting diets, as I am constantly creating and tasting a wide variety of ingredients and dishes. It is because of all this indulging, no matter how balanced I try to keep it, that I tend to carry a little extra weight. Plus, I guess it could be because of my age in part: they tend to say as it is more difficult to stay lean as we get older. The keto diet is about putting your body into a state of ketosis. This means that instead of your body burning carbs (carbohydrates) for energy, you train it to burn fat as a fuel instead. At the beginning of your keto diet journey, you are supposed to have a high fat, moderate protein, and very low carb intake. This shocks your body: you stop giving it carbs for energy and it has no choice to start switching over to burning fat instead, because there are no, or very little, carbs coming in. Keep in mind there are carbs almost everywhere; they are not just in bread and pasta. Sugar, whether natural or processed, also represent carbs. Therefore, on the keto diet, where carbs are very closely monitored, a whole array of foods must be eliminated: read your food labels or do your research and you will be shocked at how many foods have a tremendous amount of carbs. Other than some berries in small proportions, you are not even supposed to have most fruits because of the high natural sugars in them. After a week or two of doing this, you then start reducing some of the fats, keep the proteins about the same and increasing the vegetables. Some people at this point will also do some intermittent fasting, as well (like skipping breakfast two or three times per week), but I am not interested in taking it to that extreme. Part of the beginning transition into this diet will consist of going through a “keto flu”. The effects of this will vary from person to person, but sure enough, after two days into the diet, I came down with flu like symptoms for about 48 hours. I had body aches, chills, and a slight fever. To be honest, I felt terrible and was almost ready to give up on this whole keto craze, but I knew from my research that this was a temporary transition stage, so I stuck it out and sure enough the symptoms went away. I am now on day 13 and I have lost nine pounds, so far. I have lots of energy and my meals leave me satisfied and feeling full for much longer than any diet I have tried in the past. Does that mean I don’t miss carbs? Of course not. I miss them tremendously, but it is easier to stay on track because I feel so good. It is in our nature to crave something when we can’t have it. Not just with food, but with anything. The more you can’t have something, the more you want it. Please keep in mind here that I am not a doctor, dietician, or nutritionist. I am just a chef, with a few extra pounds around my mid-section that I want to lose. This is just my take on this whole keto rage, and I highly recommend that you talk to a certified health professional before embarking on any major dietary changes in your life. Do I plan to do this keto diet forever? No. To me, that would not be healthy. I truly believe that we should always monitor what we are putting into our bodies, but also having a truly balanced intake of many types of foods. My plan at this point is to try this for 100 days, just to say I tried it and see if is effective or not. However, it is important to point out that I cannot do 100 days straight through because of my career. There will be some “splurge” days within that timeframe, but I will do my best to stay on track the best that I can. If, after these 100 days, I am successful and happy with the results, I may follow up this column with another entry on the results. However, if not, you may never hear me talking about keto again. 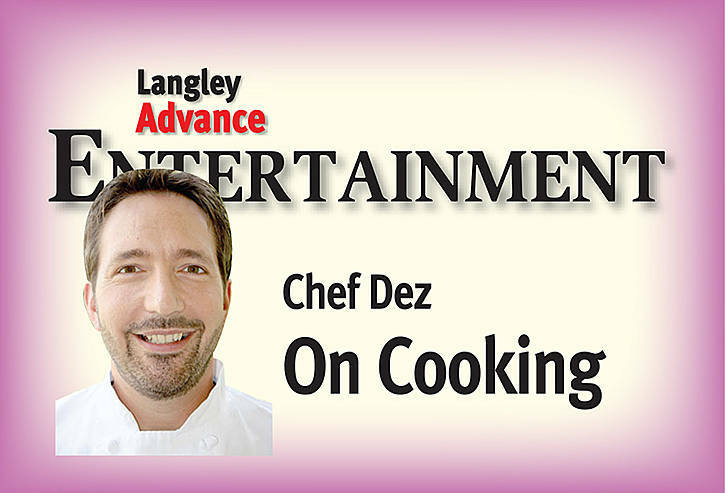 Chef Dez is a food columnist and culinary instructor in the Fraser Valley. Visit him at www.chefdez.com. Send questions to dez@chefdez.com or to P.O. Box 2674, Abbotsford, B.C. V2T 6R4.